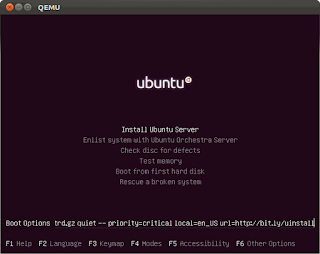 From the Canyon Edge: Ubuntu Server Quick Install, No Questions Asked! 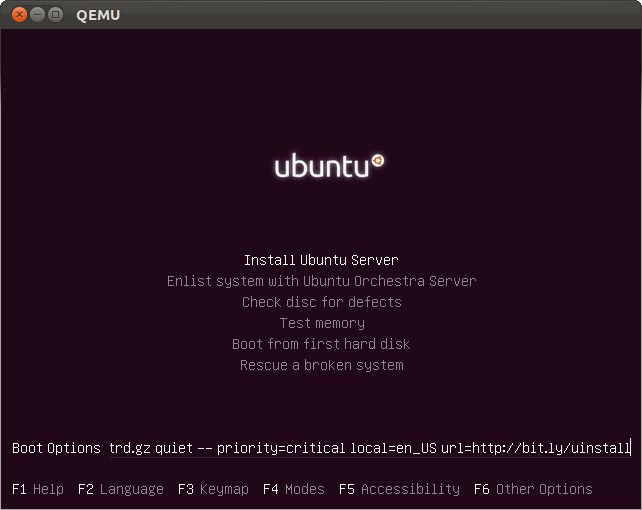 As you might imagine, I install the Ubuntu Server a lot, so I'm frequently asked about preseeding Ubuntu Server installations. There are some excellent resources out there. I have learned much from several Debian sites, as well as from fellow members of the Ubuntu and Debian developer communities. Most of my daily installations are throwaway KVM virtual machines on my development laptop. I have answered the same questions in Ubuntu's installer thousands of times... "Yes, I still speak English, my keyboard is US, please do remove all partitions and yes that partition layout is just fine!" Of course these questions are preseedable in Ubuntu. You just need to craft that magic preseed file, but that's necessarily trivial. In this post, I am sharing just such a layout with you at http://bit.ly/uinstall. And your installation should proceed from start to finish, with no questions asked! fine for my VMs, might not be so fine for real hardware! You are welcome to point your installations at http://bit.ly/uinstall, if you like. I'll keep the above documentation up-to-date, and that URL active and functional, as I'm using it all the time! This is awesome Dustin. TAMULUG has done this previously at our install fests, saves alot of time! it works only for server edition? Great!! I had a debian preseed file for installing lenny, but I always wanted to make one for Ubuntu! This one is cool! Thanks again!! re-inventing debian-installer documentation for dummies. p.s. really cool stuff, actually. for those who are so lazy like me. thanks! Thanks, Dustin. This is fantastic. It's annoying to have to keep checking in on an install when you're just firing up a vm to check something. It just wasn't quite annoying enough for me to do anything about it. Now I don't have to. Sweet! Is there anything release-level specific in it? The "priority=critical" kernel parameter was something I was missing, and this post clued me in to what that was! Almost impossible to find debugging information on why it's not proceeding if you're missing it! Hi Dustin, thanks a lot for this, It has help me a lot when dealing with masive instalations. However for today it looks like the link is down. Thanks Dustin. This is great! You know what controls the installation packages for the first time ubuntu server? Thanks a lot. Unfortunately http://bit.ly/uquick is currently unavailable. Could you post the contents here? The link is to http://bit.ly/uquick is as Kim says broken. Link is coming up as broken? It does ask questions. At the Write changes to disk part. It will stop and ask, and also at Finishing Partitioning.